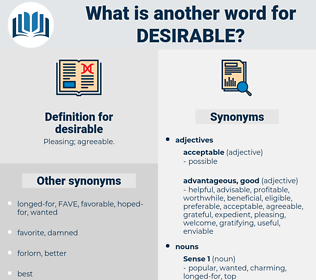 What is another word for desirable? 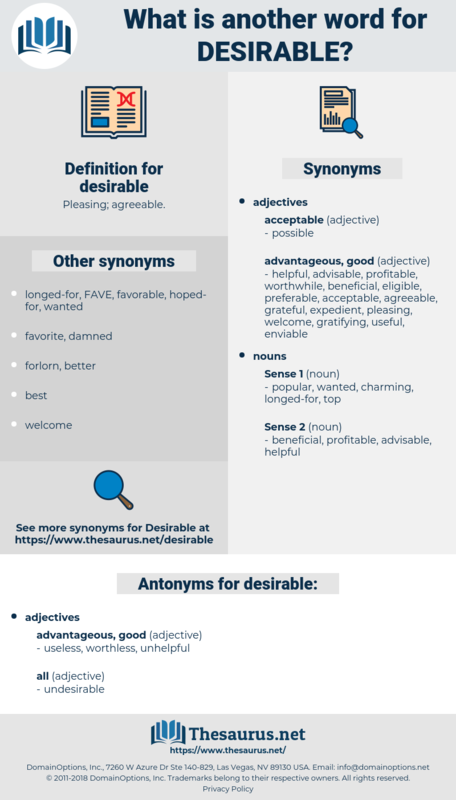 beneficial, necessary, acceptable, helpful, sensible, favourable, reasonable, inappropriate, preferred, viable, indispensable, best, better, Recommendable, laudable, timely, fit, proper, enviable, favorable, optimal, fitting, unsatisfactory, essential, valid, required, profitable, adequate, important, pertinent, positive, hospitable, idealistic, right, prudent, recommended, conducive, meaningful, wanted, justifiable, needed, intended, unacceptable, seductive. preferable, suitable, appropriate, expedient, worthwhile, ideal, useful, feasible, advantageous, attractive, inadvisable, commendable, satisfactory, interesting, sought-after, affordable, wise, valuable, advisable, opportune, appealing, hoped-for, salutary, deliberate, marketable. hurtful, repulsive, evil, disagreeable, harmful, bad, detrimental, injurious, disadvantageous, unprofitable, disgusting, unattractive. imprudent, ineligible, unseasonable, unwanted, profitless, inopportune, unfeasible, untimely, impolitic, impractical, inadvisable, injudicious, inexpedient, unwise. It is a principle of mine not to trust even the ears of the deaf with what it is desirable to keep secret. If they had not thought of that themselves, it was not desirable to bring it to their attention and burden them with one more anxiety.